SPARC experiment concept. Photo: MIT News. The Massachusetts Institute of Technology (MIT) and the private company Commonwealth Fusion Systems (CFS) announced on March 8th their collaboration to develop technology for producing energy from nuclear fusion within the next 15 years. Their new approach is based on new high-temperature superconductors that have become commercially available recently. Those superconductors will allow to strengthen the magnetic field that confines the plasma and will allow to build smaller and cheaper nuclear reactors than the actual projects such as ITER or JET. This project has attracted $50 million in support of this effort from the Italian energy company Eni, and CFS is expected to invest around $30 million in the following 3 years. According to the chief executive of CFS, Robert Mumgaard, “the collaboration between academics and industrialists should help the team to drive fusion technology out of the lab and into the marketplace”. 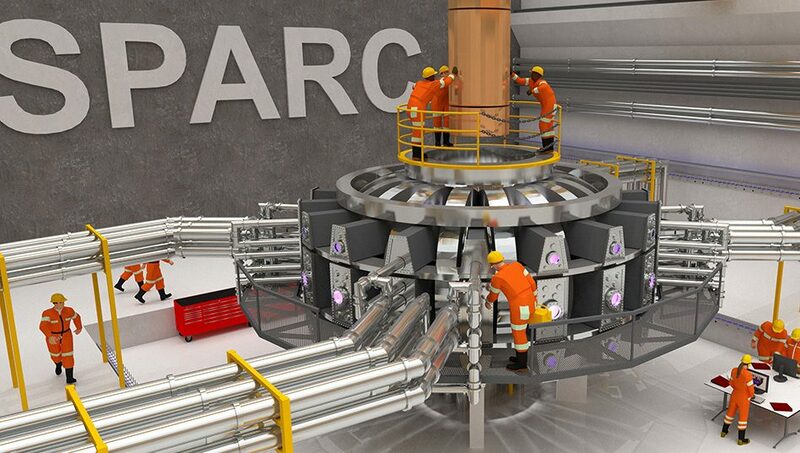 The planned fusion experiment, called SPARC, is a Tokamak expected to be around 1/65th of the ITER volume and is expected to produce 100MW of heat with an expected Q factor of around 2. The Q factor is the ratio of heating input power to thermal output power, and the actual maximum achieved Q is 0.67 by JET. Their first challenge will be to transform the commercially available superconductor into a large, high-performance electromagnet. Their target is to produce energy from nuclear fusion within the next 15 years and within the next decade the team hopes to develop a prototype reactor that can a Q>1. This experimental device will be complementary to ITER because the last one is intended to work at larger scales (500MW with a Q=10). Achieving these objectives would prove that commercially-viable fusion power can be produced in smaller Tokamaks and this would be a milestone for the Fusion community.